NIce little pub that has music on regularly. I saw Right Said Fred there a few months ago and it was brilliant fun. Best bit about this pub is the quality of the beer. As a Yorkshire man exiled to the South this is the best place to get a decent pint of Timothy Taylor's. Plus points - the manager when I went in was very helpful and they had a decent pint of Doom Bar on. Negatives - It's a Lloyd's Bar so all the atmosphere of a Wetherspoons (i.e. drunk people even at lunchtime) but with more expensive prices. Worth visiting if you want to watch sport on TV as there are plenty of screens. 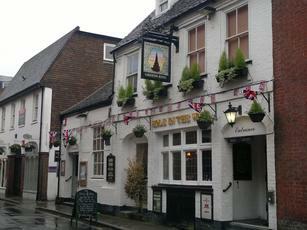 If you want a quiet pint and a chat with friends, Chichester has better pubs. Tucked away down a narrow alley just off the pedestrianised shopping precinct, this at first glance looks as though it could be a hidden gem of a quaint old pub. That�s not quite what we found though, although there is some exposed brickwork and a couple of old leather sofa�s just inside the door. Essentially it�s a sports bar with five plasma�s dotted around the place, a pool table and a darts board. Beers on offer were Timothy Taylor Landlord, Greene King IPA and Abbot Ale. The only cider was Strongbow unfortunately. I worked here in 2001 as a student and from the reviews not much has changed! Sort it out Hole in The Wall! Used to be nice for pensioners at lunch times and students in the evenings...sounds like a chav haven now.